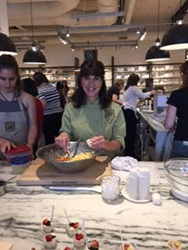 Premier chef, Jodi Abel, served up some of her delicious summer treats at Williams-Sonoma’s Kickoff Event at University Town Center on Friday, July 1. 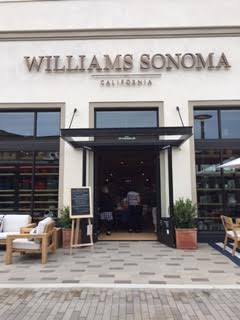 The event was held to celebrate Williams-Sonoma’s new store opening in La Jolla, showcasing chefs and cooking companies in the San Diego area. 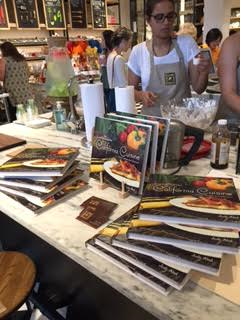 Chef Jodi was on-hand to promote her best-selling cookbook Lajollacooks4u: California Cuisine: Fresh, Simple and Delicious, an easy-to-follow cookbook featuring gourmet farm-to-table California cuisine. Appealing to home-cooks, gourmets, and foodies alike, the cookbook features delicious and fresh recipes that offer something enticing for every cook regardless of experience level or dietary preference. With over 70 fresh culinary creations to choose from, it’s no wonder why these books flew off the shelves! Chef Jodi performed cooking demonstrations throughout the event, in which she prepared her signature Corn and Feta Cheese Salad, as well as a delicious Goat Cheese Mousse with Chocolate Wafer Crumbs. She had the opportunity to meet and greet with store customers, share some of her favorite cooking secrets and sign copies of her book. Chef Jodi and her team were thrilled to play a part in the grand opening activities at the new, magnificent Williams-Sonoma store. Lajollacooks4u, founded in 2008, provides an ideal activity for corporate team building, couples and any foodie looking for a unique cooking and culinary experience in a magnificent setting overlooking the Pacific Ocean. Based in La Jolla, a suburb of San Diego, CA, Lajollacooks4u has enjoyed record growth since its inception in 2008 and has been ranked as one of the area’s top attractions on the popular travel review site, Trip Advisor. Chef Jodi Abel also recently released her cookbook, Lajollacooks4u: California Cuisine, an accumulation of the favorite recipes her guests have been raving about. For more information about her cooking events, as well as her cookbook, please contact jodi(at)lajollacooks4u(dot)com or visit http://www.lajollacooks4u.com.